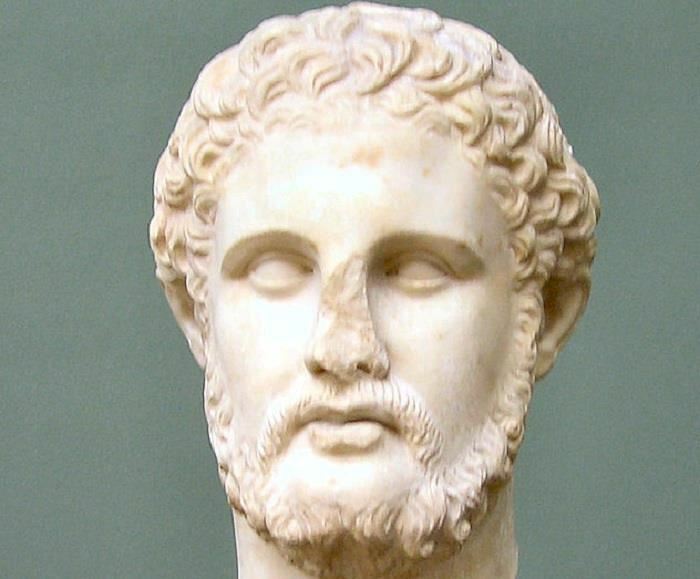 Philip II was the king of the Kingdom of Macedon from 359 BC until his assassination in 336 BC. He was a member of the Argead dynasty of Macedonian kings, and the father of Alexander the Great and Philip III. He reformed the Ancient Macedonian army and established the Macedonian phalanx which wac critical in securing victories on the battlefield. After defeating Athens and Thebes at the Battle of Chaeronea , Philip II l established the League of Corinth, with him as the elected hegemon and commander-in-chief of a planned invasion of the Achaemenid Empire of Persia. After his assassination, his son Alexander the Great would go on to invade the Achaemenid Empire in his stead. Reverse: naked youth on horse right; ΦIΛIΠΠOY, ?